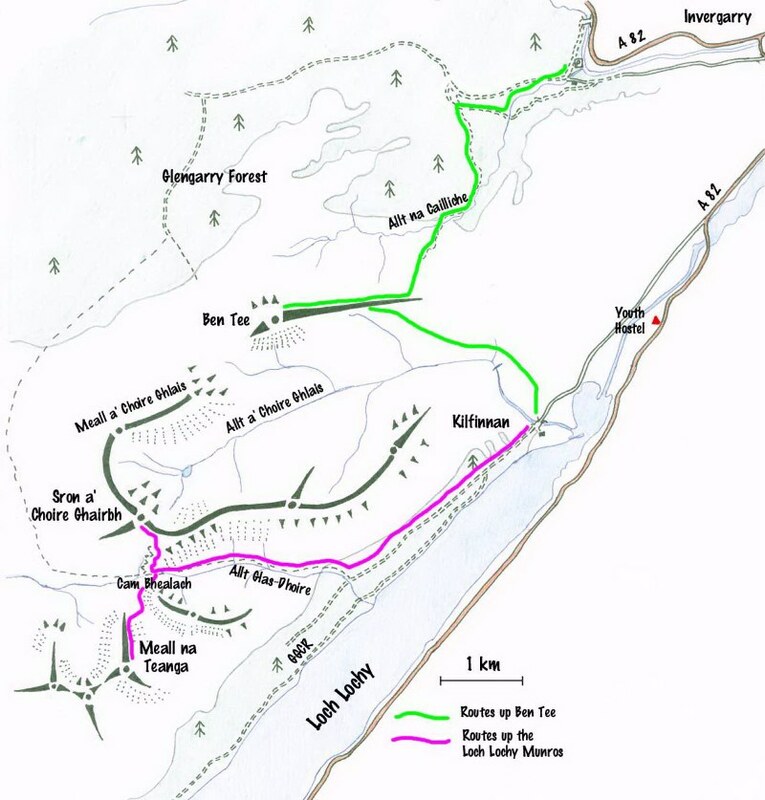 Our two local Munros are Meall na Teanga (917m) and Sron a'Choire Ghairbh (935m), on the west side of Loch Lochy. They can be accessed from the north via Kilfinnan, and from the south at Clunes or Cia-aig (by Loch Arkaig). From the hostel, the most direct route is from Kilfinnan. Take the minor road along the west side of the Caledonian Canal to Kilfinnan farm. From here walk (or cycle) about one and a half miles along the forest road (ignoring the left fork which the Great Glen Way takes soon after the gates), then turn right onto a small track which heads steeply up into the trees. Once out of the forest the track continues to climb steadily up to the Cam Bhealach. To reach Sron a' Choire Ghairbh from the bealach take the stalkers track which zigzags up the hillside to the north. When the path peters out, head directly up to the crest of the ridge, then turn northwest for the short final climb to the summit. 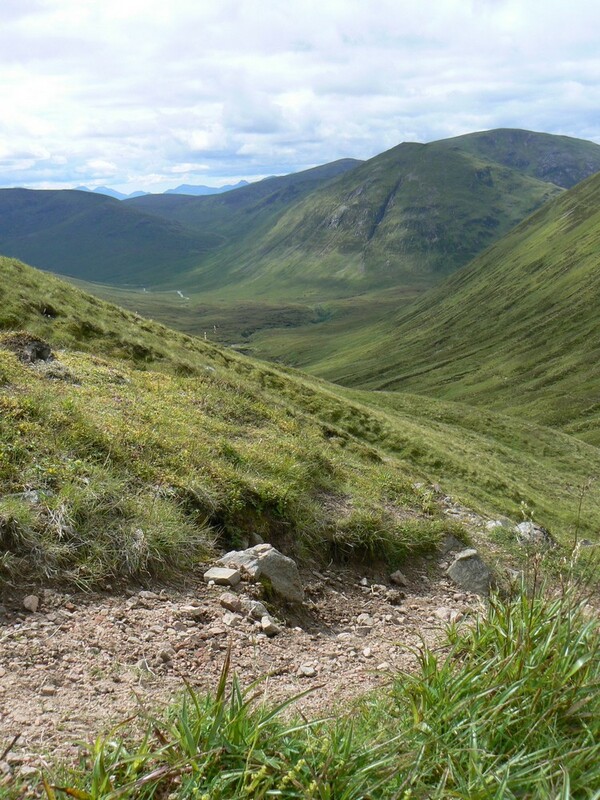 To reach Meall na Teanga, head uphill south from the bealach, skirting around the side of Meall Dubh, to reach a saddle between it and Meall na Teanga. 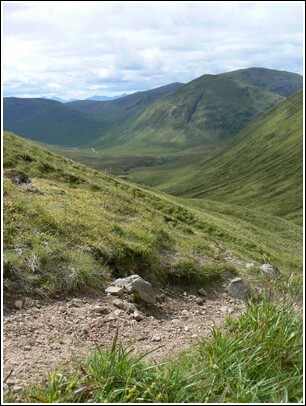 From here climb southwest up to Meall na Teanga's northern ridge, and turn south along it to the summit. (Allow an hour to reach here from Sron a' Choire Ghairbh.) Return by the same route. Ben Tee is a Corbett (901m) north of Sron a'Choire Ghairbh, on the northwest side of Loch Lochy. 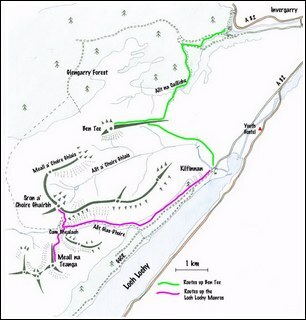 It can be accessed either from Kilfinnan or from the Forestry Commission land at Whitebridge in Glengarry. Park at the end of the sealed road to Kilfinnan, just before the Kilfinnan Burn. From here head straight up the hill in a NNWesterly direction on faint tracks to reach a track contouring NW along the side of the hill high above the Kilfinnan burn. Follow this track; after about half a mile it crosses a deer fence at a stile high above Kilfinnan Falls and then turns west towards Coire Glas before petering out. Head NW again over rough ground to Ben Tee's east ridge, then climb this to gain the summit. Return by the same route.